Join a conversation with two archaeologists who attract the bright lights and television cameras. 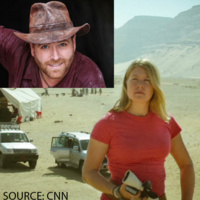 Sarah Parcak and Josh Gates share their experiences in the field and on TV, shaping our vision of past and present. Josh Gates is host of The Travel Channel’s Expedition Unknown as he adventures on a global journey to find the truth behind unsolved legends and archaeological mysteries. Sarah Parcak is winner of the 2016 $1-Million TED Prize, a National Geographic Society Archaeology Fellow, and Fellow of the Society of Antiquaries. She founded the Laboratory for Global Observation at the University of Alabama at Birmingham.